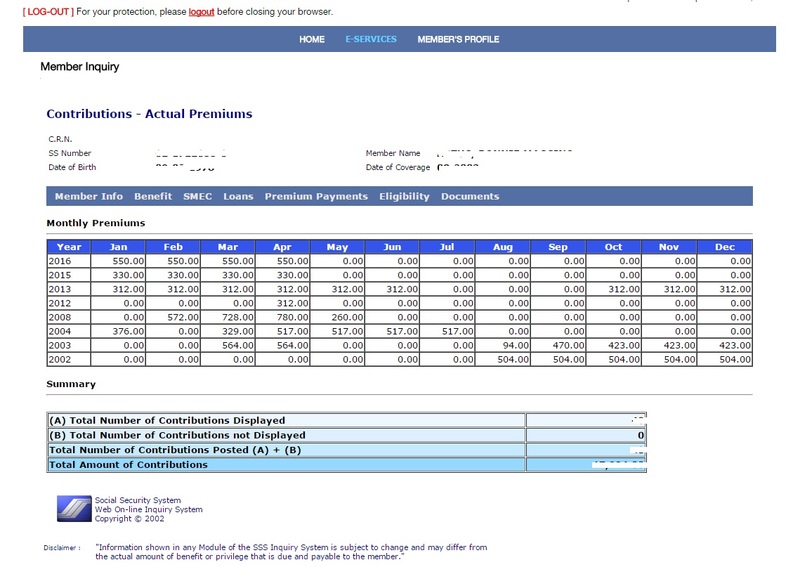 Social Security System is a Philippine government agency that provides retirement and health benefits to all paid up employees, self-employed, voluntary and OFW. As a Members of the SSS you can file a 'salary' or 'calamity' loans. salary loans is depend on the monthly salary of the employee and calamity loans are can be used when there is a calamity that has been declared by the government in the area where the SSS member lives, such calamity are as followed Super Typhoon, flooding, earthquake and natural disasters. For senior citizen, they can remit their pension once they reach their retirement age. 1. Employee - if you are a regular employee, your employer has the obligation to pay your monthly contribution which will deduct on your salary. A 50/50 share will be deposit on your monthly contribution. 2. Voluntary member, self-employed and OFW – are those member who give contribution from minimum contribution to their desired contribution. 1. Go to the nearest SSS branch where you lived. 2. Go to information desk or ask the guard and ask for RS-5 form or contributions payment form. 3. Fill up the necessary details in the form. Paying SSS contribution in Bayad Center (ex. LBC, Western Union and others), accept payment for SSS contribution unless if your monthly contribution is updated if not they will not accept any payment. It should be always updated, so pay always on time to avoid going to any SSS Branch for your convenience. After the payment, your contribution will appear in your ESI, 3 days of working days and a text will be receive from the SSS for the confirmation of your contribution. 2. Register first if you don’t have account? Or just Log-in if you have already have. 3. 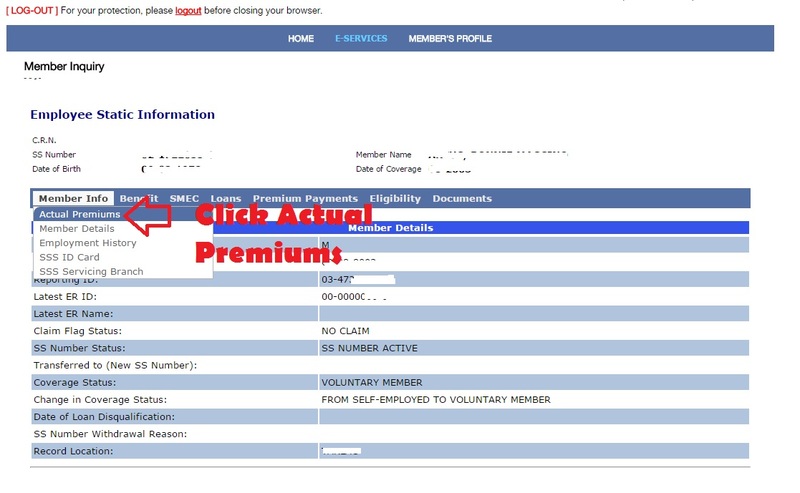 Once Log-in, click Inquiry under E-services tab. 4. For unsupported browser an instruction will pop up at the center of the screen, just click Ok to reload the page . 5. Click Step 1, where you can see the shield icon, then Click Step 2 to reload the page. 6. If everything went alright? 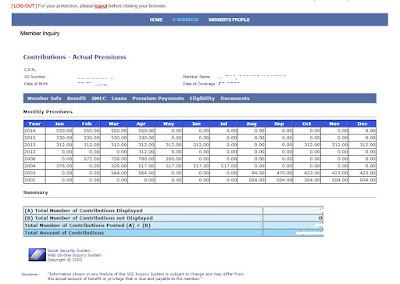 you can now vie your Employee Static Information or ESI. 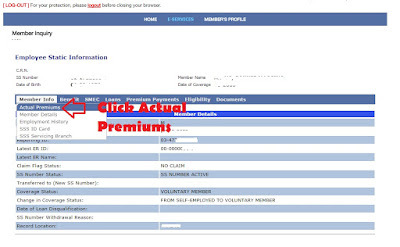 click the Actual Premiums under the Member Info tab to proceed to your updated monthly contributions. 7. You can now check your latest monthly contribution and to see to it that all contributions are updated. 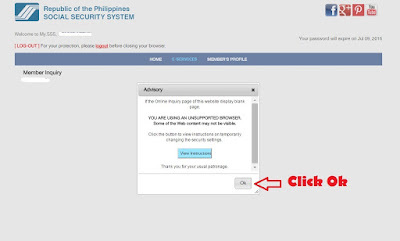 Take Note: Always remember to update or pay your monthly contributions, it may help us in the near future needs and always update your account especially the password in their website so that you can access the site anytime. 75 comments to ''SSS Latest Contribution Table and ESI Updates"
anu po ibig sabihin ng "ee" "er" "ec" etc. dun sa contribution table?? Ask ko lang po kung paano magpa verify sa buwanan kung pagbayad kung na update po ba lahat mula sa umpisa.kindly message me on my Facebook account as Leune Jein.salamat. Paanu ko po mkikita ung sss conti ution ko po?! 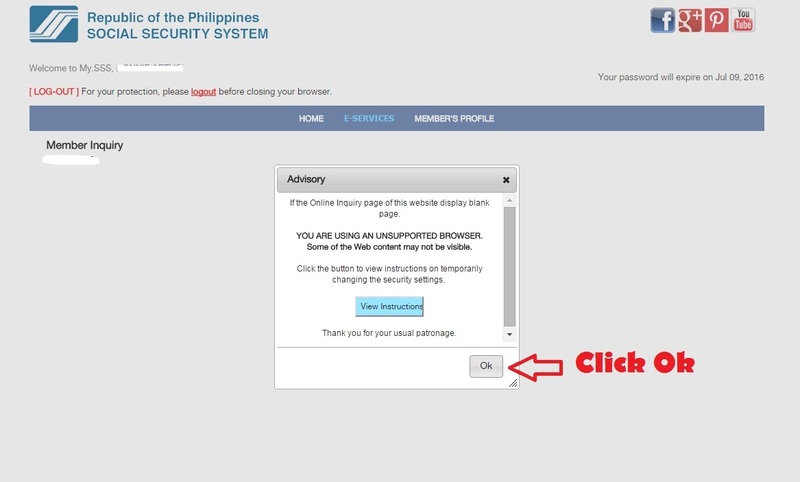 It's either magpunta kau sa pinakamalapit na sss branch para humingi ng kopya... .or gawa po kau ng account sa MY SSS, sa home page po ng SSS may makikita po kau dun na Member Login taz sa baba nun click mu yung CLICK HERE kung wala pa po kaung account sa MY SSS. tas may fifill apun po kau..
magkanu po dapat deduct pag 500php a day? Kaylan po ako makaloan uli ? Pwedi po bang humingi nang document support sa sss account ko na nag papatunay na walang na recieved na contribution sa pinag tatrabahuan kung kompanya? Makukuha ko pa po kaya maternity benefits na hindi ko pa nakiclaim? Mag2 years na po ang anak ko. hi po. ask lng po sana kung paano po makukuha ng lolo ko ung pera nya kahit d pa po sya tapos magbayad. 76 yrs old na po sya.gusto nya po kasi na i widraw na lng nya ung contibution nya. yun lng po. salamat. ask ko lang po kung saan matatagpuan ang pinakamalapit na branch ng SSS sa Dasmarinas Cavite. ? Nag register na po ako sabi kindly check your email bkit wla pong nagmessage after 30mins? Pwede malaman yung contribution ko. 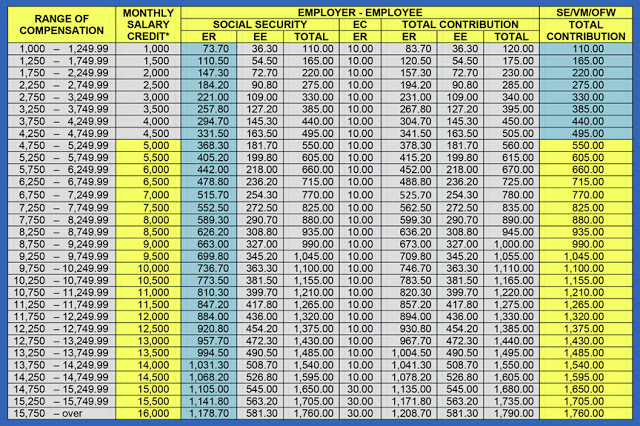 How to inquire sss contribution? 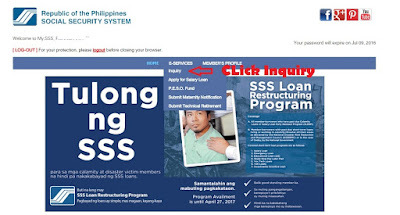 Itatanong ko lang po kung nahulugan po ba ang sss ko,kasi po gusto ko po mag loan. 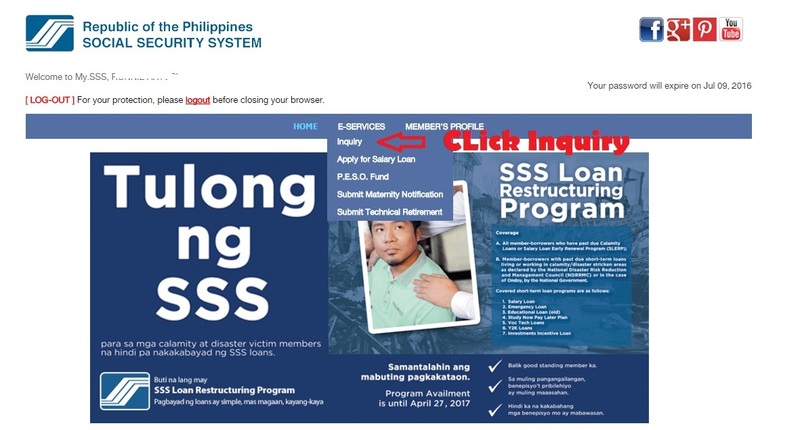 pano po ako makaka kuha ng sss contribution ko po ? Dati po akung naghuhulog ng sss volantary nahinto po ito. ano po bng dapat kung gawin para maituloy ko ang pag hulog? Pano po i verify ung sss contribution? Paano ko pa makikita ung last contribution q po? Update ko po Kung ilang month na Yong hulog ko sa sss. 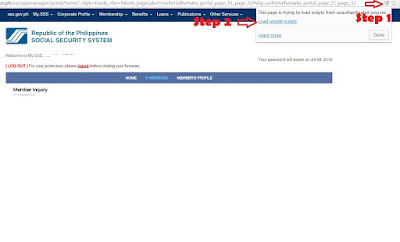 Ask ko lng po sana kung nhhulugan po ang SSS ko . for my maternity po sana . Thanks po . May benefits po ba makukuha ang isang ofw contributor?? Kng meron ano ano po un??? Good day po Paano ko pa makikita ung last contribution ko po? taking ko Lang po kong may contribution na Yong loan ko. Ask q lng po qng ilng months na po nahulog q at qng pwede na po aq mkpgloan. how am i able to see my SSS contribution? Pa check po sa count.. Ko Pwd na po bah ako mka loan..
hindi na view inquiry of contribution....I am using windows 10 upgrade naman. sss ko hindi hinologan ng agency ko mula 2014 to 2017 ano ang dapat kong gawin? Katangahang SSS last week q pa inupdate ang R3 nmin bkt hnd p rn posted ang contribution q.. check nyo dami q follow-up s mga emaail address ninyo..
What are the requirements if i want to continue my sss cobtribution?